Labor shortages continue to be an issue in the Permian, but innovation is the key to success, said keynote speaker Joey Hall, Executive Vice President, Permian Operations, Pioneer Natural Resources, during a West Texas Regional District Meeting on March 6. 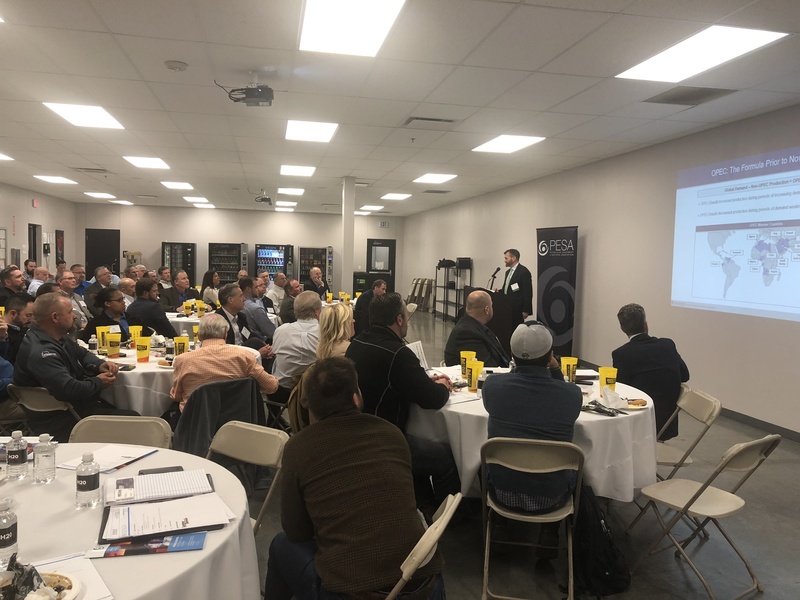 The meeting, held at the Gardner Denver facility in Odessa, offered PESA Members the opportunity to network and discuss the challenges facing service and supply companies in the Permian Basin. PESA Board of Directors Vice Chair Richard Alabaster, President – Surface Technologies, TechnipFMC, opened the meeting with discussion of the developments in PESA’s West Texas Regional District. David Christmas, Vice President, Permian Basin, Schlumberger, then introduced Joe Hoepfl, Co-Founder and Partner, PPHB, who presented his analysis of present and future energy markets. This shift has been fueled by American technological advances, including rig efficiencies, longer laterals, automation and digitization, Hoepfl said. These innovations have led to a “break-even” price that has gone from $81 per barrel in 2014 to $40 per barrel currently in the Midland area. This change has also led to an increase in production of 1.7 million barrels per day, and Hoepfl estimated Permian production will double over the next three years. Although equities have historically traded in-line with oil, Hoepfl explained to attendees that beginning in August of 2017, the industry saw equities decouple from oil prices until October 2018, when equities drastically declined in-line with the price of crude. Hoepfl predicted that the Permian will continue to lead the way while service companies fight for relevance in the public equity market. Hall then presented an operator’s perspective on the Permian Basin. The labor shortage continues to be a leading issue in the area. Hall stressed that as an operator, he prefers for service providers to be honest regarding their staffing capabilities as opposed to sending out an unprepared crew. Pioneer is creating value in the Permian for shareholders by increasing the Return on Capital Employed (ROCE) by 9 percent while increasing cash flow and improving capital efficiencies. The company expects to run 21 to 23 rigs during 2019. Innovation is the game-changer in the Permian, and Hall highlighted a few of Pioneer’s cutting-edge projects. The new “Pioneer Pad” enables 24 wells to be drilled from the same pad, reducing surface usage. The company’s dedicated water management subsidiary supplies the low-cost water necessary to drive a multi-year development plan across a large, contiguous acreage position. In addition, the company’s new centralized facilities are designed to accommodate greater than 80 wells, allowing for capital efficiency. According to Hall, Environmental, Social and Governance (ESG) issues are also a priority for Pioneer. This includes reducing emissions, using a greater mix of effluent, water reuse, brackish water and promoting a proactive safety culture. West Texas Regional District Meetings create productive group settings to address critical issues and share best practices. 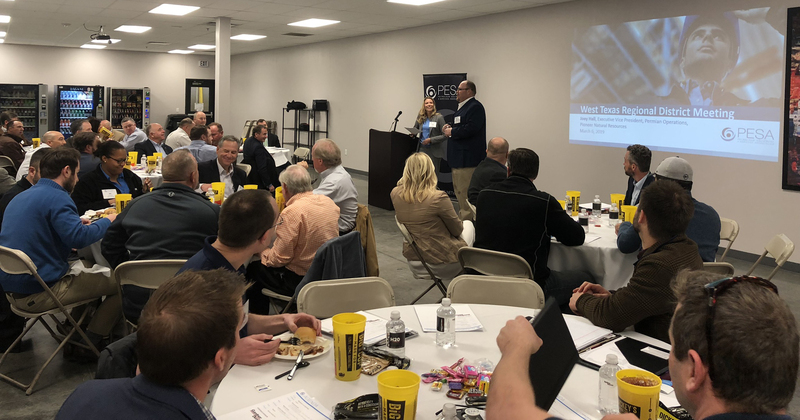 For information about future PESA events in the Permian and beyond, please refer to the PESA Event Calendar or contact Molly Determan, PESA Vice President Strategy & Programs. The next district meeting is set for May 23, featuring Denzil West, CEO, Admiral Permian Resources.